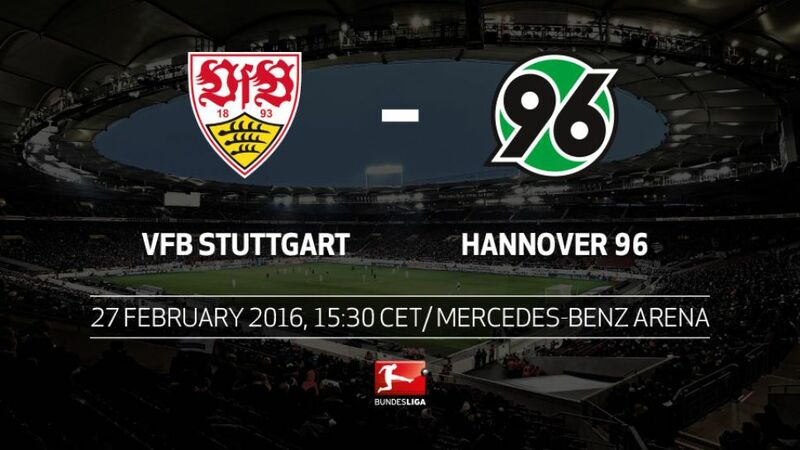 After drawing at FC Schalke 04, in-form VfB Stuttgart will be targeting victory over struggling Hannover 96 at the Mercedes-Benz Arena this Saturday (kick-off 15.30CET/14.30GMT). Only league leaders Bayern München have picked as many points as Stuttgart in the second half of the season. Down in 18th at the turn of the year, the Swabians' come-from-behind 1-1 draw in Gelsenkirchen last Sunday was the first time Jürgen Kramny's men have dropped points this calendar year. That form is in stark contrast to Hannover, whose 1-0 reverse against FC Augsburg last weekend was their 16th defeat this season. Basement side Hannover have lost their last five away from home and have already suffered 16 defeats this season. That is one more than in the whole of the 2014/15 campaign, when Die Roten finished 13th.If Hannover lose on Saturday it would equal their club record of nine consecutive Bundesliga defeats in a row.Hannover have failed to score in their previous four Bundesliga games. This is their worst barren run since the end of 2002, when they went five games without a goal.Stuttgart are the form team in the league, having taken 13 points so far in 2016. Hannover, in contrast, are still without a point this year. No other team has managed less than four points in the second half of the season.Stuttgart have won their last three Bundesliga home games. The last time the Swabians managed four home wins in a row was when now-Hamburger SV coach Bruno Labbadia was at the helm nearly four years ago.Stuttgart have not lost any of their last six games against Hannover. In fact, no team has fared worse against Jürgen Kramny's men in recent meetings. The Reds have lost 16 of 19 matches at Stuttgart.Stuttgart defender Daniel Schwaab has yet to lose against Hannover in eight games. He also scored his only Bundesliga goal against Hannover in the 1-0 home victory last season.